The Uganda Rugby Cranes will face Kenyan side at Ngong Road this Saturday for the return leg of the Elgon Cup which also dubs as the Africa Gold Cup. The team that faced the Kenyan Simbas at the Legends Rugby Grounds in Kampala recently has only undergone a slight change with veteran player Mathias Ochwo replacing Robert Aziku. Robert Seguya , the Uganda Rugby Cranes Assistant Coach, is confident Ochwo will pair well with Uhuru Charles to deliver the desired results. “Mathias is a good ball jumper, ball carrier and he is also good at tackling,” Seguya said, adding that the veteran player brings a lot of experience and leadership to the team. Uganda goes into this game with a five- point deficit after the 18- 23 loss at home. The team of 27 players that will travel to Kenya for the Saturday game includes Asuman Mugerwa, Alex Mubiru, Brian Odong (Captain), Mathias Ochwo, Charles Uhuru, Brian Asaba and Scot Olouch. Others are Marvin Odong, Ivan Kirabo, Ivan Magomu, James Odong, Pius Ogeno, Michael Wokorach, Lawrence Sebuliba, Philip Wokorach, Cyrus Wathum, Collins Kimbowa, Adnan Mutebi, Cox Muhigwa, Musa Muwonge, Gerald Ssewakambo, Justin Kimono, Kevin Makmot, Santos Senteza , Joseph Tamale, Byron Oketayot and Ronald Musajja. The team will then travel to Senegal for the second game of the Africa Gold Cup scheduled for July 1, in Dakar. The Kenyan Simbas have dominated the Elgon Cup winning it nine times against Uganda’s three wins. 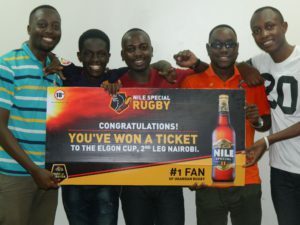 Uganda Rugby fans are expected to throng Nairobi to cheer the team, thanks to Nile Special, the Rugby Cranes Sponsors, who have organised transport for selected winners of several challenges conducted on social media.